In general, EU4 does a much better job of avoiding micromanagement than previous Paradox games. Where EU and most of its Paradox siblings (Crusader Kings, Victoria) fall down is the way they represent wars — victory is a matter of hunting down individual enemy stacks and laying siege to individual enemy provinces, which becomes painfully tedious with large countries2. As is, this is a big reason why I rested on my laurels after absorbing China — I just did not feel up to any more massive conquests (although I did fight plenty of defensive wars and smallish wars of empire). In the short run, the most practical solution may be to allow players to automate armies and navies. Players can already order their armies to automatically suppress rebellions, and give general directions to AI allies, so I’d like to give my armies general directions to hunt down enemy armies or besiege an enemy country. Hearts of Iron has had naval automation (”patrol a given sea”) for the better part of a decade. In the long run (EU5? ), I find myself thinking of Sid Meier’s dictum that if something is so tedious that it has to be automated, then it probably shouldn’t be in the game at all. That suggests that the war-fighting system could do with a re-think of sieges3 and a more general emphasis on fewer, more interesting decisions4. I am encouraged by the tremendous strides EU4 has taken in another area. Recent patches have addressed one of the series’ biggest problems — the randomness with which rebellions, and other devastating events, would pop up. At best, dealing with rebels was busywork. At worst, they felt frustratingly unfair — rebellions can be enormous, several times the size of a major power’s standing army (see my Great Britain LP for an example). I’ve previously quoted Sid Meier on this point — player psychology and random disasters are a volatile mix! In contrast, under the new rules, discontent will usually build up before it erupts5, while a new “local autonomy” system gives players an additional lever to control unrest. I cannot overstate what a positive change this is. 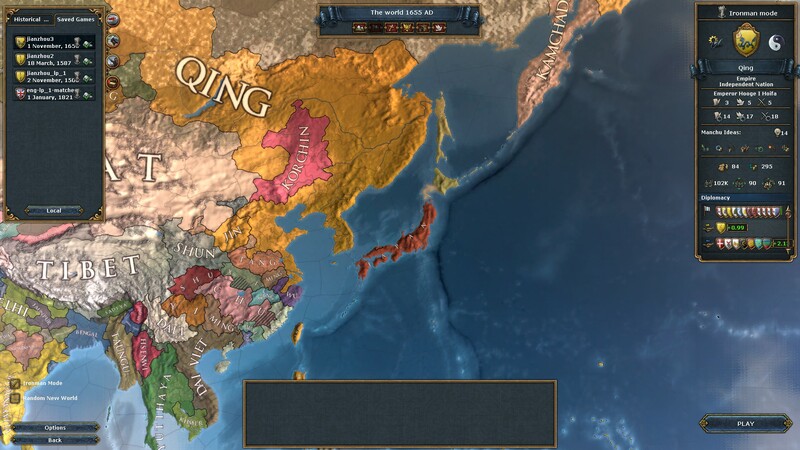 My first two Manchu runs ended, Sui Dynasty-style, when I overreached and found my empire gutted by rebellion. Crucially, this felt fair. Under the new rules, I could see the disasters looming; I just failed to respond properly. When rebellions scuppered me, I happily jumped back in for another try. I would also like to see some faster means of conquering China — as far as I can see, the lengthy truce after each war makes it impossible to replicate the speed of the historical Manchu conquest. Perhaps Chinese pretender states should have a special casus belli, usable against each other, that would make it easier to reunify de-jure China. I realise Paradox has the unenviable task of modelling an empire that was strong for almost 300 years before it collapsed; I expect future tweaks to come. Looking back on my Ayutthaya and Qing campaigns, I definitely prefer playing small, non-Western nations. First, they feel more dynamic: their story arc progresses from minnow to regional power to world power. Second, I think the game mechanics work better with smaller countries. Third, one of the coolest things about Paradox games is their representation of polities (Ak Koyunlu, Majapahit, Vijayanagar…) that would never appear, much less be playable, in any other game. Enacting their stories is a unique experience — and a fun introduction to the history of different parts of the world. The tribes north of China (the three proto-Manchu groups of Jianzhou, Haixi, and Yeren, plus Korchin and Buryat) begin at roughly even strength: two of them can check a third. This is a two-edged sword. Two tribes allying against you, or getting caught in a two-front war, spells trouble. But if you can attack and force-vassalise one tribe out of the gate, that makes it easier to snowball your way through the remaining tribes. And I do recommend force-vassalising the other tribes rather than immediately annexing them: it spares the trouble of pacifying their territory, and early on their troops are very useful. Other important neighbours include Ming, Korea, and the Oirat Horde. 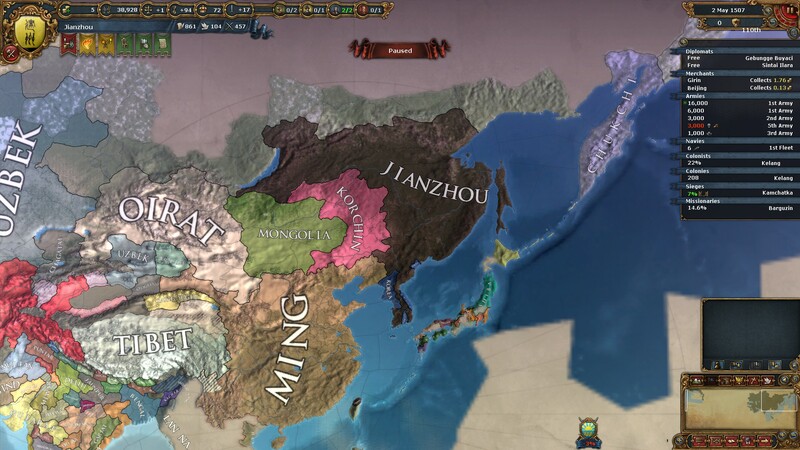 The Ming, at first, are a sleeping giant. The Oirats are very much a proactive giant; I recommend improving relations with them ASAP, with an eye to forming an alliance. And watch out for Korea, which can tilt the balance of power if it allies with a tribe. 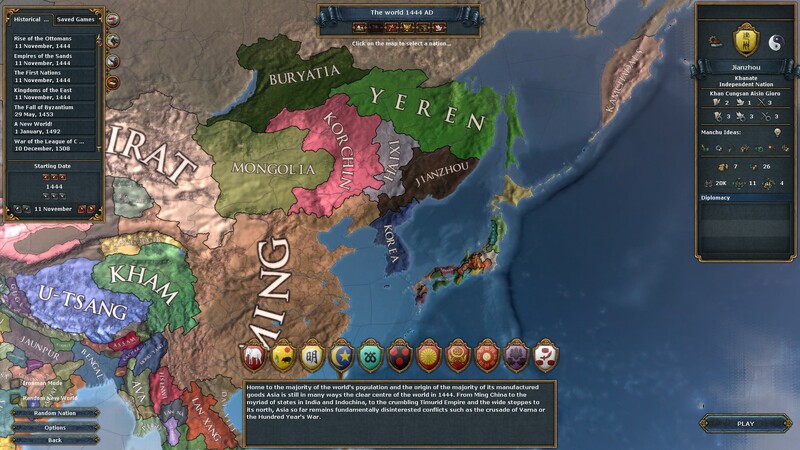 After uniting the Manchu tribes, you will have the decision to settle down, lose your tribal status, and form the new Manchu nation. Don’t rush into this! Tribes excel at early conquest: they have better units until approximately tech level 10; they have a larger force limit; they get a generous casus belli on every neighbour; and they can amass cavalry (which is better in the early game) without penalties. Stay as a tribe until at least tech level 10 or so, and until you’ve conquered as much as you can. I recommend obtaining the Exploration idea group early on, and then colonising Siberia, Southeast Asia, and the west coast of North America. Siberia and Southeast Asia will provide money and manpower, and Siberia will also block off the Russians. Meanwhile, America provides a great short cut to Westernisation. Sail northeast and conquer the Kamchadal, who inhabit the easternmost tip of Siberia. Using this as a base, you can then colony-hop across to Alaska, and then down the western coast of North America. Just be careful not to plant so many colonies that a colonial nation pops up! Then wait for the Europeans to plant a colony next to your border. Money will be tight early on. To start with, I recommend conquering northwards towards the Buryats, as they control a gold mine that will help a lot in the early game. 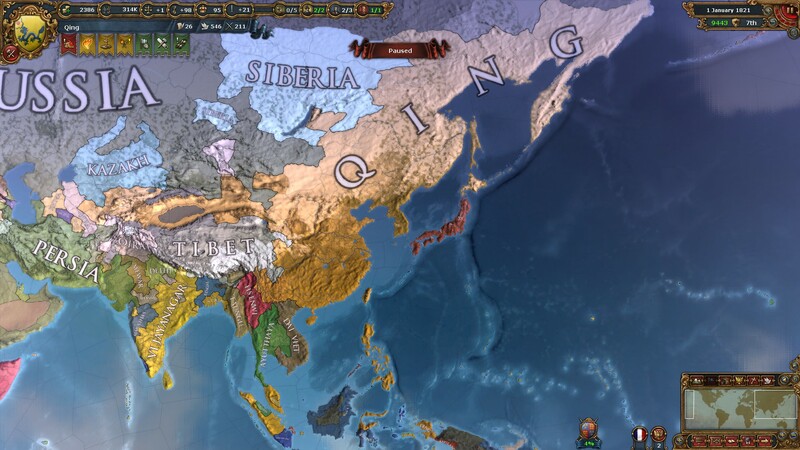 Eventually, once you can take on the Ming, prioritise the capture of Beijing – it is wealthy and not far from the border. Other rich provinces can be found along the coast and especially the Yangtze Delta, such as Yangzhou and Suzhou. After conquering China, the world will be your oyster. Good luck and have fun! Paradox supplied review copies of Europa Universalis IV and the Conquest of Paradise and Wealth of Nations DLCs. I bought the Res Publica and Art of War DLCs out of my pocket. LOL! Everybody blobed at end game. Also why did you left Japan alone? Shouldn’t you “follow the money” and get some trade companies? You know, trade companies hadn’t occurred to me! They were added after my trade-focused GB campaign in 1.0, so I wasn’t very familiar with the mechanic. I left Japan alone (well, most of Japan – I took Hokkaido) for the same reason I left Ayutthaya, Dai Viet, etc alone once I reconquered the Chinese provinces they’d snatched from Ming. 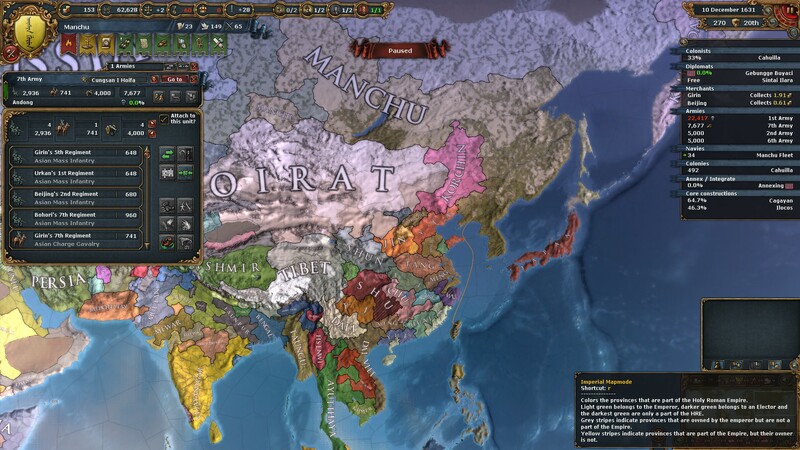 While I could easily have defeated them, it would have taken time and hassle to absorb them into my empire, and I’d already fulfilled my goal for the game by conquering China.